The SoC inside your phone is a utmost complicated piece of silicon. Chipset manufacturers like Qualcomm (Snapdragon), Samsung (Exynos), Huawei (Kirin) and Apple (A-series) are trying to enhance the capability of their chips in every yearly refresh. Fabricating the chip at lower nanometers helps to squeeze more components without expanding the die size, which in turn increases the energy efficiency. It’s a tricky problem to find the optimum combination between raw CPU power, battery usage and additional features like AI co-processors. Another leading factor is the cost. To find a feasible solution (rather a set of solutions), chipset makers come up with multiple end products targeting different price and performance segments. Samsung is one of those few smartphone makers who can make in-house chips of multiple components – be it the camera sensor or RAM or flash storage, including the CPU itself. Exynos 9820 is the current gen flagship SoC from the South Korean tech company, which also powers the global edition of Galaxy S10 lineup. Due to some alleged complications in patent deals with Qualcomm, Samsung has to sell a different variant of Galaxy S10 in the USA and a few other markets. Powered by Qualcomm Snapdragon platform, these variants are reportedly better performer than the Exynos models. FYI, the Snapdragon 855 was fabricated using a 7 nm process whereas it was 8 nm for the Exynos 9820. The performance versus energy efficiency index is clearly in favor of the Snapdragon models. As a matter of fact, several Galaxy S10 users have reported about a weird battery issue with their global Exynos models. The phones are unable to go to the deep sleep mode under a number of circumstances, resulting higher battery drain. If I use my phone a lot (and I mean a lot) for example when I’m traveling i get about 6 hours of SoT which is great with a 3.100mah battery and heavy usage. However on a regular day the phone just seems to discharge itself when in standby mode and I don’t even reach 3 hours of SoT. There are some users that have been reporting, using apps such as CPU Spy, that the phone does NOT enter a deep sleep state in standby. Some resourceful users over on the S10+ have found the cause of the issue, which is a bug with the proximity sensor. The bug is triggered AFTER entering a VoiP call such as WhatsApp call or Skype, at which point the phone will continue to fail to deep sleep until the next restart. Thus, in order to fix the issue, in the meantime I recommend restarting after VoiP calls, and report the issue to Samsung through the Members app in hopes of getting it fixed. 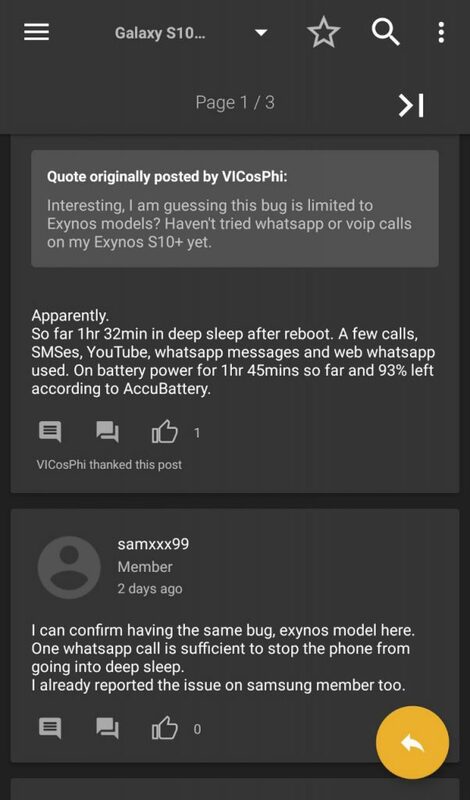 @andreif7 please be aware of the deep sleep bug of the exynos s10 that is triggered after entering a voip call. No reviewer addressed it yet. The issue seems to be a derivative of the proximity sensor issue which wrongly wakes up the phone (for example, inside pocket) and drains the battery. However, as pointed out by multiple users, the triggering events are VoIP calls in this case. I can confirm, that it happen after Whatsapp and FB Messenger call, or even when You play voice messages via this apps. Not sure about Google Duo. Users started to monitor the CPU frequency switching over time and found out their phones were failed to enter in to the deep sleep mode, i.e. the CPU cores could not be suspended. They were draining batteries even when they were supposed to be idle (for example, screen turned off). All three models of the Galaxy S10 lineup – S10e, S10 and S10+ are affected by this battery draining bug, according to user reports. 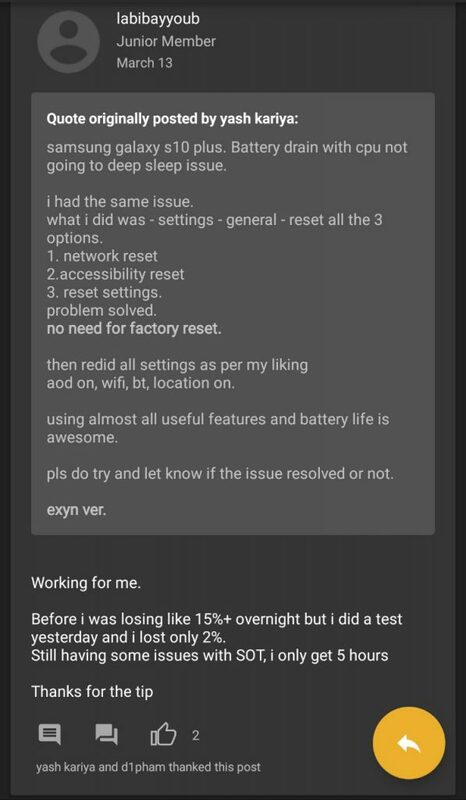 Factory resetting seems useful, but certainly not a feasible solution to the hapless “battery draining fast” glitch. Some users have found out that resetting the Accessibility, Network and General settings individually can be effective as well. This solution was posted on the S10 forum and certainly helped me. There’s a bug that stops the phone from going into a deep sleep mode post making a call (audio/video) on apps like WhatsApp, Skype et al. The solution for the time being is to reboot the phone once before going to bed. I tried a lot of other things but had a ~2% hourly standby drain which reduced to <5% overnight after figuring out this solution. I have both WiFi and Bluetooth on at night. You may try to play around with the battery saving tweaks in ONE UI but nothing worked as well as this has. Hopefully there’ll be a more practical fix to this soon. However, these workarounds are not universally applicable. Some of the affected users are not using WhatsApp or Viber, yet they are facing the astonishing battery drainage bug. I have my S10E scheduled to reboot every night but this doesn’t seem to fix the issue and I also don’t use whatsapp/telegram voice/video calls, so I don’t think is is quite the issue. We hope Samsung will address these pestering bugs in future updates. A iconic flagship phone riddled with bugs from its inception is not a good sign for a smartphone maker. 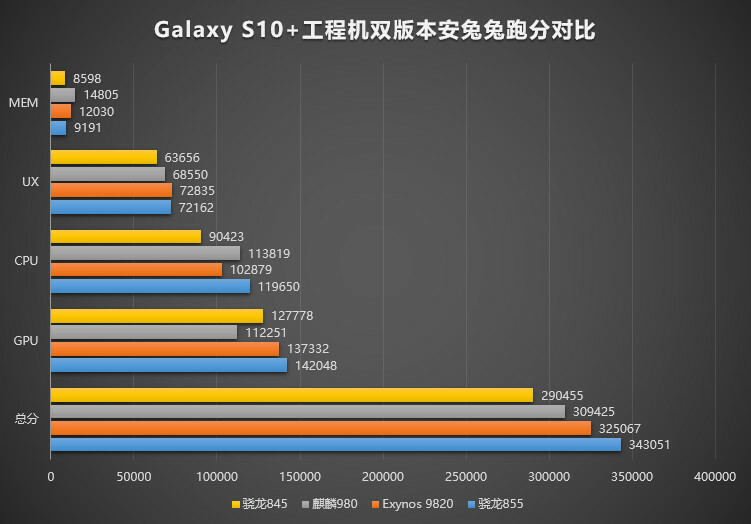 The reception of the overall battery life of the Galaxy S10 series is kind of polaroid among the end users. There are several adverse factors affecting the battery life. See here for further details. Samsung is currently rolling out a new OTA update (build number ends with ASC8) for Galaxy S10 series. Along with the March security patches, the new build reportedly fixed the deep sleep issue on Exynos models after VoIP calls. Details here.